“When the American people, through their Congress, voted for a twenty-six-billion-dollar highway program, the most charitable thing to assume is that they hadn’t the faintest notion of what they were doing.” So warned Lewis Mumford in 1958, two years after the inauguration of the U.S. Interstate Highway system. “Within the next fifteen years,” Mumford added, “they will surely find out.” The following decades indeed proved Mumford right. As the “preposterously unbalanced program” pursued the utopian mirage of a city in which anyone could drive anywhere, anytime, and park at the destination, it destroyed much of the urban America it was meant to serve. Since the 1930s, as state highways funded by gasoline taxes entered cities, packed surface parking lots and parking garages erased much of America’s urban space. The urban interstates accelerated the trend. At their worst, they were “pyramid building with a vengeance: a tomb of concrete roads and ramps covering the dead corpse of a city.”1 If the consequences were not always so bad, it’s because local residents stopped some of the most destructive projects, and because some resourceful communities pursued alternative futures. Autonomous vehicles can correct for these excesses—or exacerbate them. Getting this right will demand recovering a history we’ve lost, and escaping a history written for us by those with a stake in it. Such destructive extravagance was sold as the rational product of applied science. It was indeed substantially rational in its methods, many of which were so routinized as to be almost automatic in their application: traffic demand measurements, level of service grades, and functional classification systematized highway engineering processes. But routinized programs can only implement solutions to the problems humans define. Ludwik Fleck, the Polish scientist and philosopher of science, explained that “the formulation of a problem already contains half its solution.”2 If we misstate the problem, we may preclude the best solution. The more effectively and the more zealously we solve the wrong problem, the worse the result. When bleeding and purging patients didn’t work, eighteenth-century doctors bled and purged them more—to the detriment of their patients. They got the problem wrong. To them, the problem was “how do we cleanse the blood and restore balance to the humors?” The destruction of American cities to accommodate automobiles, the urban sprawl surrounding these cities, and the loss of alternatives to driving were not the wrong solution. They were the right solution to the wrong problem. Autonomous vehicles can treat these symptoms or exacerbate them, depending upon how we formulate the problem. In autonomous vehicles and other intelligent transportation systems, we may have a solution so powerful that we fail to pause and ask what problem such systems are best suited to solving. In autonomous vehicles and other intelligent transportation systems, we may have a solution so powerful that we fail to pause and ask what problem such systems are best suited to solving. We may fail to ask whether the problem formulation we inherited is the right one. We may justify an emphasis on autonomous cars out of a misreading of history that tells us that we must begin with the assumption that Americans prefer to drive. Above all the neglect of history—or what is much the same, the uncritical acceptance of agenda-driven histories others have packaged for us—may deprive us of hard-earned experience. Experience is the parent of judgment. How strange, then, that so often we find innovators contending that innovation negates the validity of experience: “this changes everything.” Our solutions may be new but the problems of society—the problems of living well together—ultimately are not. The problem formulations we inherit are the products of history. Born in the 1930s, accelerating to a crescendo in 1956, and persisting ever since, the dominant American surface transportation problem has in effect been: How can motorists be permitted to drive wherever and whenever they want, and to park at their destinations, with minimal delay and with reasonable safety? In rural America this problem formulation was not unreasonable. In cities, however, it began as a revolution against older formulations that were antagonistic to automobiles.3 Because the private motor vehicle’s spatial demands made it incompatible with density, the new formulation had profound implications for cities. Right: Getting the problem wrong. Portland, Oregon (1962; Café Unknown, July 2010). Left: Still getting the problem wrong. Atlanta (2014; Google Maps). Autonomous vehicles will be a powerful tool. But they cannot tell us what purpose they will serve. The time to ask is now, before autonomous vehicles become common. If we retain the problem formulation of the mid twentieth century, autonomous cars will offer us a better solution to the wrong problem. If we retain the problem formulation of the mid twentieth century, autonomous cars will offer us a better solution to the wrong problem. Each car will safely travel faster, require less lane space (width and length), require less fuel, make better use of existing road and parking capacity, and demand much less attention from the driver. If total driving (vehicle miles of travel—VMT—per person) remained constant, the achievement would be spectacular. But under the prevailing problem formation, per person VMT would not remain constant. If engineers continue to seek to accommodate all of motorists’ demands, and if they accommodate such demands much more efficiently, each car may make much more efficient use of road and parking capacity, but total demands may rise so much that even more space will be needed for road surface and for parking. In the fully autonomous vehicle, as the driver need pay little or no attention to driving, driving time may become work or play time—in effect negating the time cost of travel. Autonomous cars might also safely travel much faster. Such changes might turn the 50-mile commute of today into the 100-mile commute of tomorrow. Today, people trying to travel by other modes—such as walking or bicycling—must contend with urban sprawl governed drivers’ perceptions of distance. How will they reckon with distances that have doubled again? Presumably many of them too will resort to driving. However reluctantly they turn to it, their decision will be taken as a vote for driving. Finally, as the skill demands of driving fall we’ll have more drivers. Such trends would mean that we would continue to rebuild the world for drivers, instead of asking what world we want to live in and conforming driving to it. If intelligent systems accelerate vehicular “connection speeds,” Americans may spend more total time in vehicles, use them for even more tasks, and negate the space and fuel savings that autonomous vehicles might offer through a different problem formulation. In 1865 William Stanley Jevons cautioned that more efficient steam engines would not conserve Britain’s coal supply; instead they would increase total national coal consumption because more enterprises would make more use of the more efficient engines.4 More recently, “Jevons’ paradox” has been independently rediscovered by each web user, who finds that faster connection speeds mean more total time spent online, not less. If intelligent systems accelerate vehicular “connection speeds,” Americans may spend more total time in vehicles, use them for even more tasks, and negate the space and fuel savings that autonomous vehicles might offer through a different problem formulation. Given difficult facts such as climate change, depletion of fossil fuels (or recourse to fracking, tar sands, and other controversial means of supply), urban sprawl, and the public health costs of physical inactivity, such trends would be cause for alarm. In averting these trends, history is our greatest ally—and our greatest threat. History legitimizes some problem formulations, and in so doing delegitimizes others. Parties with agendas to advance tell versions of history that serve these agendas. But impartial histories, pursued with care by researchers with no financial stake in the result, and who welcome correction from each other, can expose and excise false formulations. The most influential histories we have inherited were designed to serve agendas, however. For example, one of the first defenses of any effort to accommodate all driving demands at any cost is the assertion that Americans prefer driving. More precisely, history allegedly shows that Americans in general have an unconditional preference for driving over alternatives. 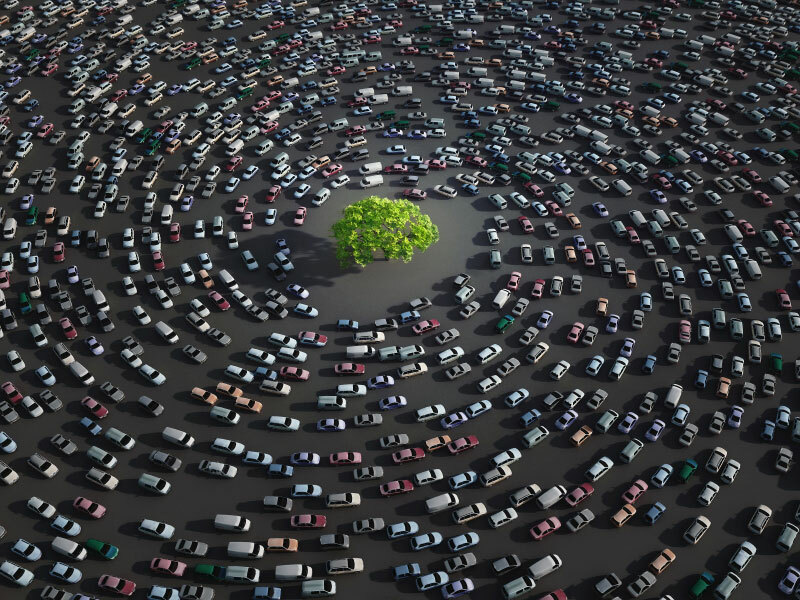 Critics and defenders of the automobile agree that Americans have had a long “love affair with the automobile.” For the critics, the love affair is a misguided infatuation from which Americans must be rescued; for the defenders, the love affair is the free preference of a free people and must be honored as such. But both agree that Americans prefer driving. Yet no one on either side of this debate seems to recognize that the “love affair” metaphor is not a sociological fact, finding organic expression in a term of folk wisdom. It was an invention propagated to serve a purpose. Introduced in 1958 in a criticism of the automobile industry (John Keats’ The Insolent Chariots), the phrase was readapted as a defense of the automobile in 1961 in a one-sided television history of the American car. Millions saw “Merrily We Roll Along,” an episode of NBC’s Du Pont Show of the Week (Du Pont owned a 23 percent share in General Motors, to which it sold varnishes and fabrics5). Host Groucho Marx told Americans the history of the automobile in the United States as a love affair between the American man and the (feminized) automobile. Love is blind; social critics can find fault with it but in a free society the will of the people must be honored. And love will find a way—whatever the costs. In this little drama, critics of the automobile’s excesses become outdated, prudish chaperones. Americans still choose the car—but they do so in an environment deprived of good alternatives. 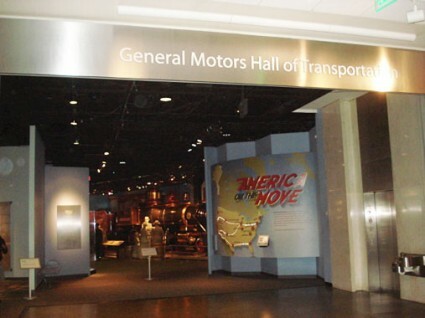 “America on the Move,” National Museum of American History (photo: author). The love affair thesis is essentially a free choice thesis. It is history written by those with a stake in history. It is an ex post facto justification. It is not an outright falsehood. Such lies seldom work. Instead it is a tactical distortion that sidelines appeals to common sense by appeal to a greater power—love. What’s lost in this stratagem is the negation of choice in an environment lacking good alternatives. Lock a man in a 7-11 for a week and study his diet. If we find that he eats a lot of processed food products, we can’t conclude that he has a thereby expressed an unconditional preference for them. Urban Americans chose the car only after a protracted struggle for control of the formulation of traffic problems—a struggle in which many of them fought on the losing side, and which the victors were a minority.7 Americans still choose the car—but they do so in an environment deprived of good alternatives. They choose not in a free market of equal alternatives, but in an environment in which drivers don’t pay the full cost of accommodating cars and in an environment built to accommodate cars at all costs. The love affair thesis, by which the car is always “good,” invites an equally fatuous rejoinder: the car is always “bad.” Too many have accepted the invitation. Those who do unwittingly support the love affair thesis by accepting its premise—that cars are either good or bad. Like any useful tool, the car has purposes to which it is ideally suited. It is particularly well suited to low-density areas and as a connector between transportation hubs. As a taxi or shared vehicle it can also be very useful in dense cities. But those with an interest in promoting cars succeeded in casting America’s transportation problem not as a problem of moving people but as a problem of accommodating cars everywhere—even to the point of rebuilding cities for cars. In so doing they diminished Americans’ range of transportation choices, as if their free choices could not be trusted. If we rebuild the landscape for autonomous vehicles we may make it unsuitable for anything else—including walking. What kind of city do we want—and what kind of mobility will serve it best? Autonomous vehicles can serve the right solution to the right problem. In a city built for primarily people, and in which vehicles serve people, autonomous cars can valuably supplement integrated transportation systems in which each mode is suited to its purpose, in which transportation modes serve the city (not the other way around), and in which transportation success is measured by people moved and not by vehicles moved. They can serve a city in which more needs can be met without vehicles, in which vehicles can be shared, in which walkable distances can be conveniently walked, in which bicycles can connect homes and shops, and in which mass transportation services can make a virtue out of density. But before we make autonomous cars the solution, we must formulate the problem correctly. Until we do, we risk accelerating a journey to the wrong destination. If we rebuild the landscape for autonomous vehicles we may make it unsuitable for anything else—including walking. What kind of city do we want—and what kind of mobility will serve it best? Before we uncritically accept the answers we inherited from the past, let us reexamine the question. Mumford, “The Highway and the City,” Architectural Record 123 (April 1958), 179-86. Fleck, Genesis and Development of a Scientific Fact (1935; University of Chicago Press, 1979), 37. 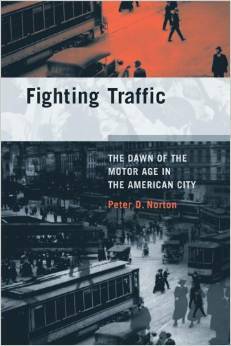 Peter D. Norton, Fighting Traffic: The Dawn of the Motor Age in the American City (MIT Press, 2008). Jevons, The Coal Question: An Inquiry Concerning the Progress of the Nation, and the Probable Exhaustionof Our Coal-Mines (London: Macmillan, 1865). Robert F. Freeland, The Struggle for Control of the Modern Corporation: Organizational Change at General Motors, 1924-1970 (Cambridge University Press, 2001), p. 4. “What Happened to Streetcars?” (exhibit sign), America on the Move, National Museum of American History. An ethical dilemma: When robot cars must kill, who should pick the victim?